Today is a big day, folks. And it’s been a long time in the making. So I am STOKED to announce that today marks the official launch of an organization called The Sustainable Seafood Blog Project: a group dedicated to raising awareness about sustainable fishing practices in the blogging community. The website – as well as our Facebook, Twitter, and Pinterest accounts – will serve as a resource for bloggers who want to integrate a discussion about sustainability into their posts. We are also developing extensive resource sections for consumers who want to learn more about seafood sustainability issues. Here, you’ll have access to a database of nationwide seafood distributors committed to sustainability, as well as restaurants, non-profits, and companies who share our vision. You can also sign up for our email list to receive newsletters, profiles of Partner Bloggers and Businesses, and tips on making sustainable seafood choices in your own diet! This is the first step in establishing a network of bloggers, businesses, and consumers who share a common goal of sustainability in our food system. I hope you’ll take it with us! As an Environmental Studies Major in college, I got to hear about sustainability every day. Many of you know that my Honors Thesis and several summers of research focused on food security, sustainable food systems, and the importance of home cooking. As a result, I got to spend my college years talking about the importance of sustainably sourced food. But that’s not a typical experience. We don’t all get a four-year crash course on the way we eat: we just have breakfast, lunch, and dinner and go on our merry ways. That’s why I started The Sustainable Seafood Blog Project: a resource for regular people with busy lives to learn about sustainable seafood and easily integrate it into their own diets. It’s time to start a larger conversation about sustainability, especially when it comes to our seafood. We don’t often think of fish as a finite resource – after all, the oceans are huge and if we need a fish, we just go out and catch it! But ocean species are the last class of animals that we hunt on a mass scale, and it’s taking its toll on our environment. The Bluefin Tuna, for example, has been fished to near extinction due to high demand (it’s prime merchandise, especially for high-end sushi restaurants around the world – one just sold for $1.75 million!) and poorly enforced fishing regulations. The extinction of this species is a VERY bad thing, and not just because we’d miss out on high-end sushi. The Bluefin Tuna is one of the ocean’s great predators, and predators in any ecosystem keep a number of smaller species (their prey) in check. When you take away a predator, other species can multiply and run rampant, causing a host of new problems. Though it may not always seem like it, the removal of one single species can have an extreme impact. These are the issues we need to bring to people’s attention, and these are the conversations this project aims to start. My hope is that The Sustainable Seafood Blog Project grows into something amazing. I think it has the potential to bring bloggers together in a way that we haven’t seen before, and become an exceptional resource for anyone who wants to eat more sustainably. Business partnerships with an expanding group including Sitka Salmon Shares, Blue Ocean Institute, and Sea to Table demonstrate this project’s ability to take it all the way. I hope that you will all take a few minutes to peruse our site, follow us on social media and join the email list – thank you for reading, for loving food, and for taking this important step with us! Make sure to visit the Partners celebrating our launch with their own seafood posts this week! Orange Curried Cilantro Salmon and The Start of Something AWESOME. Preheat oven to 375 degrees. Grease a medium-sized baking sheet. Mix all rub ingredients together in a small bowl. 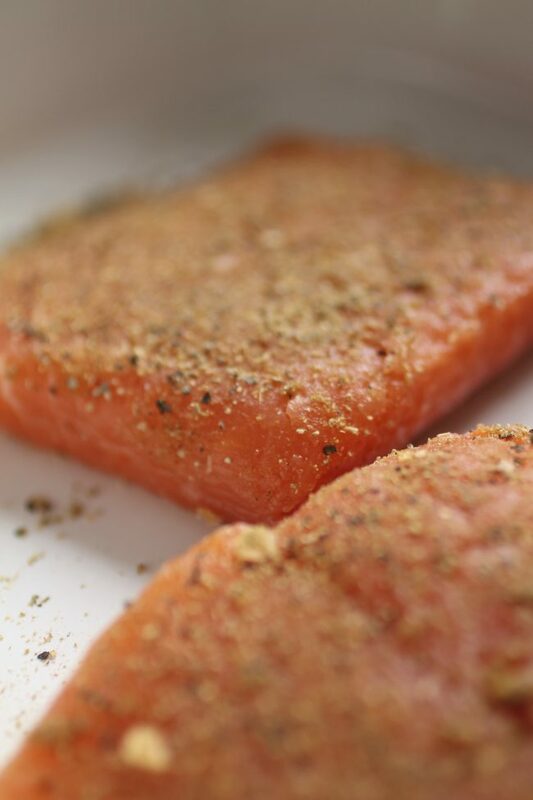 Sprinkle ¼ of the rub onto each piece of salmon and massage it into the fish with your hands. Place the fish on your greased baking sheet and slide it into the oven for 12-18 minutes, until salmon is cooked through and flaky. (If you like your salmon more well done, leave it in the oven an additional 3 minutes or so). 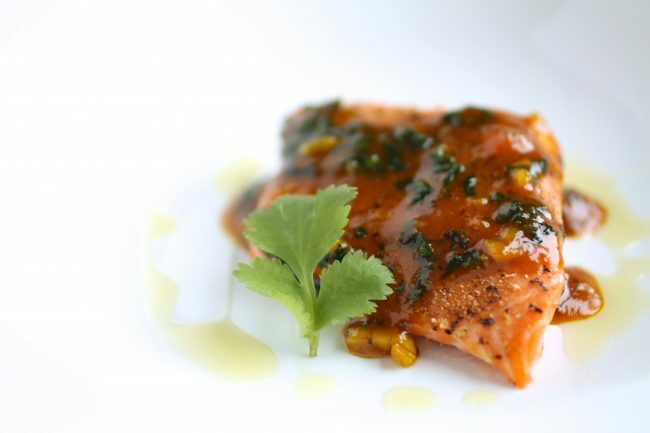 While the salmon is cooking, start the sauce. Heat olive oil over medium-high heat in a large saucepan. When oil is hot, add green onions, garlic, salt and pepper and sauté for one to two minutes, until onions are translucent and you can smell the garlic in the air (yummmm). Juice the oranges and add all but two teaspoons of the juice to the saucepan. Whisk the cornstarch into the remaining two teaspoons of orange juice and set aside. Whisk curry powder, apricot jam, cumin, and chopped cilantro into sauce. Stir until jam has melted into sauce and you have a smooth mixture. Whisk remaining orange juice-cornstarch mixture into sauce and let simmer until it thickens slightly – it shouldn’t take more than a minute. 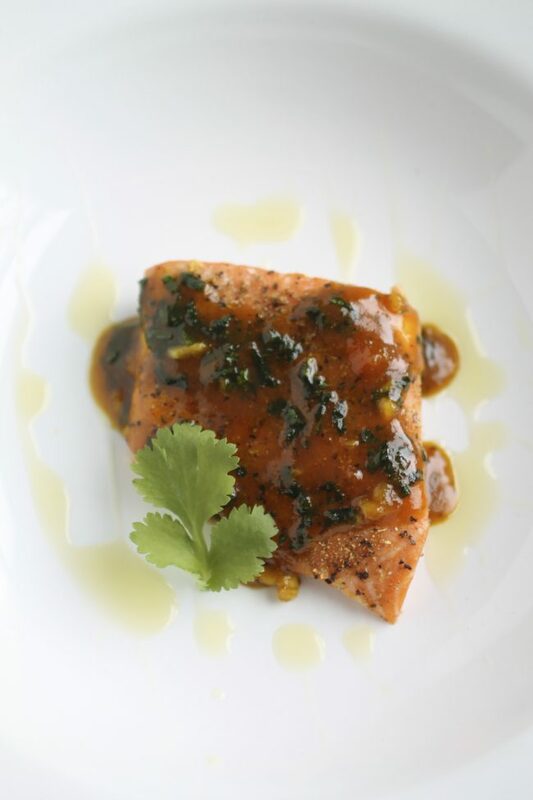 Remove sauce from heat and pour it over cooked salmon. Garnish with extra cilantro, drizzle with a bit of extra virgin olive oil, and serve immediately. 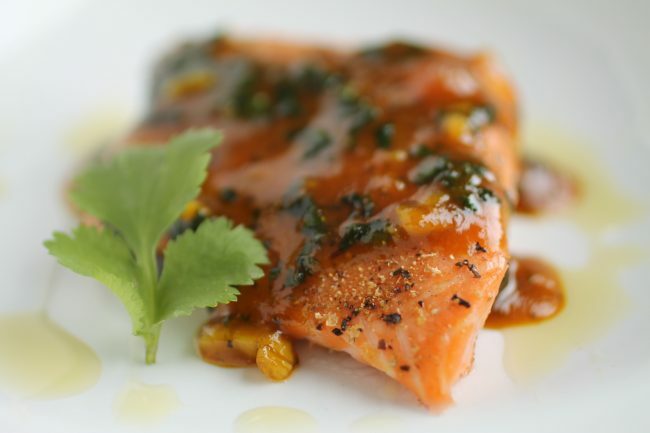 This sauce makes the perfect amount for a nice, light glaze on each piece of fish. If you like your fish a little saucier, just double the recipe! I am so intrigued and smitten with this project! And this salmon has me drooooooling all over here! P.S. Happy I found your lovely blog tonight!